Even though it was something of a box office dud in the States, we loved Pacific Rim here at GFR. Giant mechs tussling with giant monsters — what’s not to like? But even if you were lukewarm on the film itself, the design work was stellar, and perfectly suited to expanding your toy collection. So far we’ve seen some awesome Pacific Rim toys, but if you’re a fan who’s been stocking a toy shelf with NECA’s amazing toy recreations of the film’s Jaegers, crack open that wallet because more are on the way in the new year. Check out NECA’s new visual guide to their Pacific Rim toy line below. You can click the image for a larger version. NECA’s 2015 Pacific Rim releases will let you complete your Jaeger collection with toy versions of the Mark-1 American mech Romeo Blue and Horizon Brave, both of which are only in the movie incredibly briefly. Both can be seen in the film’s backstory “newsreel” segments detailing the early years of the war against the massive invading kaiju beasts. Brave is spotlighted in NECA’s visual guide, alongside another iteration on the film’s primary hero Jaeger, Gipsy Danger, of which NECA is releasing a new “Reactor Blast” version complete with some battle damage and a missing arm. 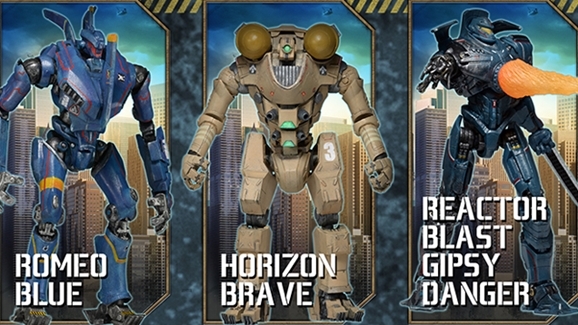 With the additions of Horizon Brave and Romeo Blue, you should be able to round out your collection of every Jaeger that appeared onscreen during Pacific Rim. 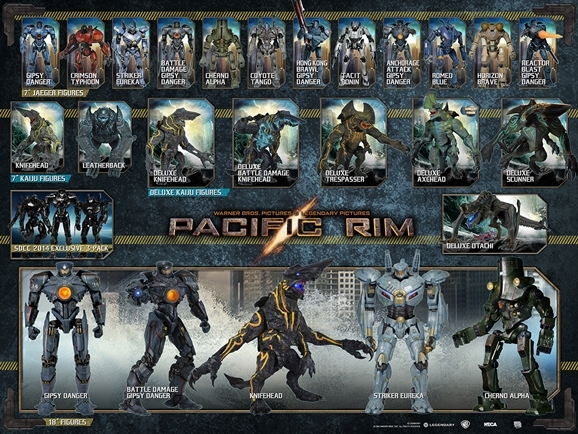 Of course, NECA can still put out variants on the various mechs, but if they really want to get extra-nerdy, they could make toy versions of the Jaegers featured in the various crossmedia elements of the Pac Rim franchise, such as the (non-canon) movie novelization and the Tales From Year Zero graphic novel. And of course there will be more Jaegers to come when Pacific Rim 2 hits theaters on April 7, 2017. Details on what we’ll see in the sequel are still limited, but we know director Guillermo del Toro will return, with screenwriter Zak Penn collaborating on the script with del Toro. Charlie Hunnam and Rinko Kikuchi Lead characters Raleigh Beckett and Mako Mori are set to reappear as Jaeger pilots Raleigh Beckett and Mako Mori, respectively, and that the story will pick up years after the events of the first film. Del Toro has also hinted that the storyline will explore “a merging of Kaiju and Jaeger.” There will also be another graphic novel and an animated series designed to bridge the two films.